Adrift, like many competently-crafted survival films, chronicles the ultimate underdog bout: Human against Nature, where the odds are stacked against the former by the sheer power of the latter. Most survival tales come with a "based on a true story" pedigree and, in that, Adrift isn't an outlier. Yet it's never the underlying truth that makes a difference in these movies; it's the craftsmanship of the director (in this case, Baltasar Kormakur) and the commitment of the actor(s) (Shailene Woodley and Sam Claflin). 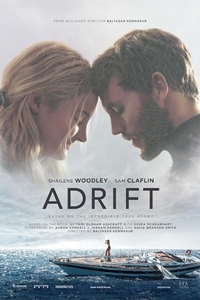 Although guilty of soft-peddling some harrowing aspects of the experience to achieve the teen-friendly PG-13 rating, Adrift nevertheless gives a flavor of the existential experience inherent in this situation by illustrating that surviving a shipwreck is as much about mental strength as physical endurance and stamina. It's 1983 and American Tami Oldham (Shailene Woodley) has fallen madly in love with Englishman Richard Sharp (Sam Claflin). A whirlwind romance - on shore in Tahiti and on board his boat - makes them unwilling to part when Richard accepts a commission to sail a friend's 44-foot yacht to San Diego. For the first days of the journey, they're blissfully happy, but the fast-developing Hurricane Raymond ends the carefree period. Entering the danger zone of the Category 4 storm's swells, the ship is swamped by a 100-foot wave and emerges as a barely serviceable wreck. Tami is injured (with a bad gash to the head and some bruising) but mobile. Richard, on the other hand, has a smashed leg (which soon becomes infected and gangrenous) and broken ribs. He's a shattered husk, only sometimes lucid as he drifts into and out of consciousness. The task of repairing enough of the boat to keep it from sinking is left to Tami. She pumps out the cabin, collects canned food and fresh water, does her best to care for Richard's and her own injuries, and uses a sextant and a watch to navigate a course for Hawaii. Miss it and she'll die at sea. Shailene Woodley, who gets a producer credit to go along with her name at the top of the marquee, invests herself as fully in the role as Blake Lively did in the shark-related survival tale, The Shallows, and Reese Witherspoon did in Wild. After starring in three Divergent movies, Woodley is no stranger to playing the strong, female lead but this is a more compelling performance than she gave in any of the YA films. Her good friend and frequent collaborator Miles Teller was originally slated to play Richard but scheduling conflicts forced him to be replaced by Sam Claflin, who also has YA cred, having portrayed Finn in three of the Hunger Games movies. His chemistry with Woodley is fitful but good enough for us to accept them as a couple. If there's an area where the movie underwhelms, it's in the depiction of the storm. We've seen more ferocious meteorological monsters in other movies like The Perfect Storm and Ridley Scott's somewhat obscure White Squall. Buildup is crucial in these situations and that's where Adrift falls short. (This is in part the result of the way the screenplay is constructed and in part because the movie wants to avoid crossing the disaster movie line.) The post-storm survival sequences, which comprise about 50% of the running time, are effectively handled. We have seen characters coping with similar situations in other movies (All is Lost and Cast Away, to name a couple) but Adrift offers a uniquely female perspective. As with many survival stories, Adrift earns its feel-good moments because there are plenty of dark instances, deprivations, and struggles along the way. Floating around in the Pacific Ocean with dwindling supplies, a mortally injured companion, and only a sliver of hope for rescue isn't the most uplifting of experiences. Tami's determination and competence keep the movie from becoming an ordeal. It's an honest, if somewhat neutered, account of what happens in situations like this, and worth seeing if you have an interest in (Wo)man vs. Nature battles.